Stevie Ray Vaughan was the premier bluesman of the modern age. Ever since he made his initial appearance in 1983, blues music has been alive, well and thriving, and he’s a primary reason why. In Love Struck Baby, the opening cut from his landmark debut album, Texas Flood, Stevie turned to the rock ‘n’ roll side of the genre – emphasiz­ing the close relationship of early rock (and rockabilly), r&b, and classic blues. It provides a fascinating study of Stevie’s famed lead/rhythm style. Tune all the strings down one half step. There are a number of unexpected devia­tions from the stock blues form in this song. The verse is a 12-bar structure, like a tradi­tional blues song, but the piece also has a pre-chorus and chorus. The pre-chorus is 16 bars long and the chorus is eight bars long – closer to a pop tune than a standard blues. Harmonically, these sections still lean heavi­ly on the standard I, IV and V chords, but the chords are arranged in a different order – not unlike the songwriting approach used by Chuck Berry in many of his classic tunes. In the solo choruses, Stevie utilizes a 12-bar blues form for his improvisations. The intro is made up of double-stops and chords, setting the tone for the rest of the piece. The opening double-stops are played over the V-IV progression in the 12th (E) and 10th (D) positions, stressing their connec­tion to parental barre chord shapes [Fig. 1]. This is a common procedure in blues and early rock improvisation, and again is gener­ally attributed to Chuck Berry. In his rhythm guitar parts, Stevie relies almost exclusively on the familiar blues comping approach popularized by Chuck Berry. This boogie-woogie derived groove is based largely on root-fifth and root-sixth voicings alternating in a very specific order. In A (the I chord): A5-A5-A6-A5 [Fig. 2]. This sequence is played in straight eighth-note rhythm and repeated as a constant pattern in the 5th position. The same pattern also occurs in D (the IV chord) throughout the song. Then it is played on the 5th and 4th strings. For the V chord, Stevie uses an E7 voicing, which is identical in shape to an open C7 form but moved up to the 5th fret [Fig. 3]. As with the intro, the solo is very roots oriented and emphasizes chord sounds. Besides the Berry-inspired double stops, there are numerous points of interest. In the first chorus, the A diminished chord and the way it’s bent is borrowed from T-Bone Walker’s bag of tricks. For those unfamiliar with the chord bending technique, this phrase is an ideal starting point. Grab the A diminished shape [Fig. 4] and try to bend each of the three strings up a half step. You’ll have to do this with individual fingers, as no other fingers are available to help you push strings, as in more conventional bending technique (i.e., reinforced string bending). This takes a little practice, but is very soulful and well worth the effort. In the second solo chorus, Stevie runs a series of parallel chords up the fingerboard chromatically. These are a bit unusual – they are 6/9 voicings, frequently found in jazz, and occasionally in uptown blues, but rarely in rock ‘n’ roll. Stevie uses the 6/9 chord as a substitute for a 9th chord, lending a more urbane touch to the proceedings. Compare the garden-variety A9 with its A6/9 counter­part [Fig. 5]. Notice the similar shape and similar notes. It is named 6/9 because it con­tains the 6th, F#, and the 9th, B, in the struc­ture. In the third chorus, Stevie hints at his Freddy King influence with the “Hideaway chord.” So dubbed by Johnny Winter and many others, this chord voicing was heard prominently in the classic King instrumental and has remained a piece of blues history ever since. Its unusual shape yields a 9th chord with the root on the high E [Fig. 6]. 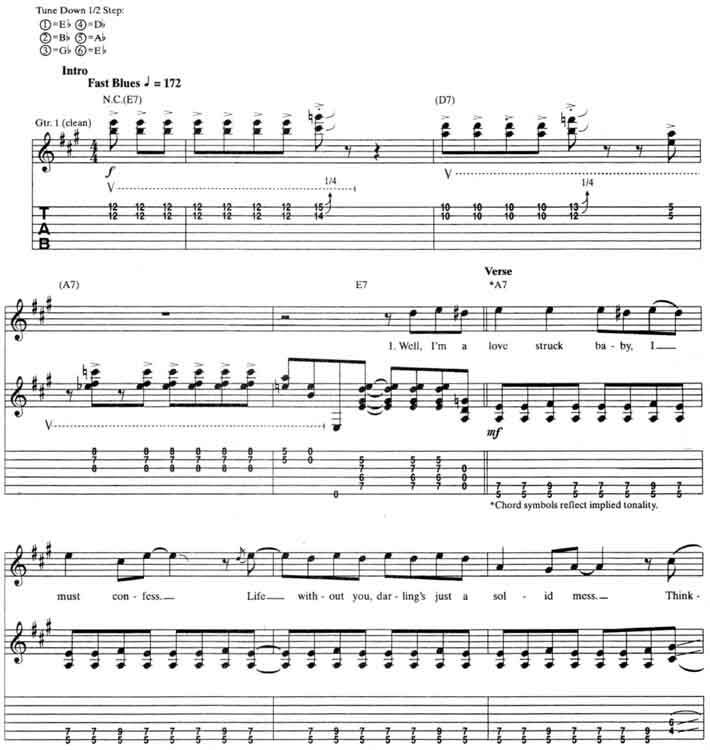 It’s a part of Stevie Ray Vaughan Love Struck Baby guitar tab and sheet. © 2012 - 2019 TabsClub Powered by TabsClub 42 queries in 0.330 seconds.